Very Strudy, and did very well with the weather. Satisfy your yearning for an outdoor living space that is asspecial to you as your indoor living space. This four-piece patioset by Safavieh Outdoor Living is as fashionable as it iscomfortable with contemporary styling and generously stuffedcushions. Friendly get-togethers and family reunions are easy tomanage while using your roomy patio set as the gathering spot. Delight in your new easy to maintain patio set with itsweather resistance and easy-care UV-protected material. 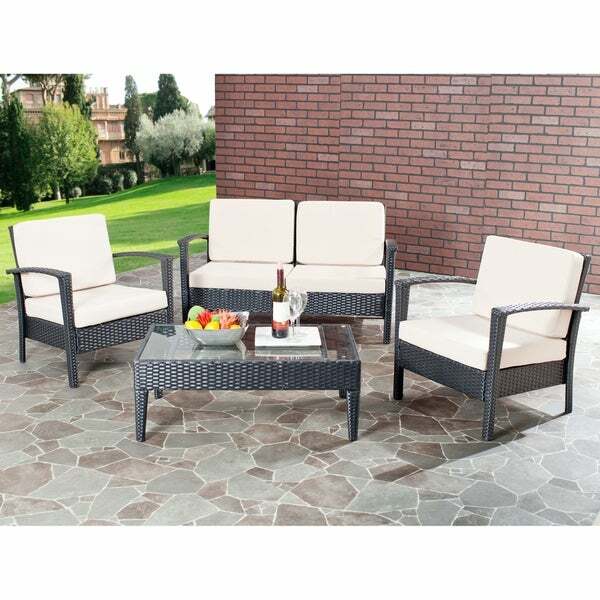 Made ofsteel, PE wicker, tempered glass and terylene fabric, thisfour-piece patio set is durable and built to last. This patio set is made for ages 3-10. This is a VERY small set. I'm 6'0" 175 and take up almost the whole couch just sitting down. This is something for a playhouse. Be cautioned - this is a very small patio set. Sits very close to floor (similar to beach chairs) but is very sturdy and comfortable. It fits beautifully in our small condo patio. We have it facing an outdoor TV and then have bar stools behind the patio set which provides additional seating when watching games, etc. Am a little concerned regarding the ivory cushions. Would have preferred a color that wouldn't show the dirt but overall still very happy with the set. Directions were not included so it took a little figuring out. Would recommend getting a real allen wrench, preferably attached to a drill. Was tight to get into some spots. Overall very happy. 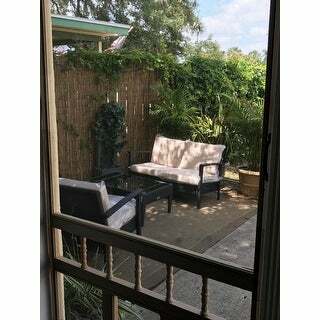 We needed a smaller patio set to go on the front porch of our bungalow styled 1920's home. The set seems much smaller when you first take it out of the boxes and assemble--and the cushions are not the most comfortable in the world. We originally didn't plan to sit on it a ton, but we found ourselves sitting on it while enjoying some wine one night. They look great on our small front porch and the cushions are now more broken in. Everyone that comes over tells us how cute our front porch is and how much they love the patio set! Easy to wipe clean and cushions have held up will! This outdoor set was easy to assemble and would complement any decor. The fabric is durable and the resin-wicker material is very stylish. I like the fact that it has squared lines without being too chunky. When this arrived it all came in one medium size box , which I thought was strange since it was a 4 piece outdoor patio set, but when we opened it and put it together we immediately knew why, it was very small , tiny sized pieces none of which a normal 5'6" woman could sit comfortably in. The cushions are a cheap vinyl that feel rough and itchy on your legs and look terrible. We are returning the whole thing ! We were very disappointed in the small scale of these pieces. It honestly looked like a kids set on our patio, which doesn't come across in the photo at all. The construction of the pieces was good and the cushions were well made, but definitely made for a very small space. I looks great on my front porch, it's like we now have a new sitting room outside. The patio set was easy to put together. Fun and perfect for my patio !! They are a little on the lower side but after using them I like that about them. They have held up very well and the cushions are comfortable. Would recommend !! Pretty great patio furniture set for the price. Not oversized chairs but great for a small patio. First thing I have gotten from Overstock that I hate. It is like little children's furniture. Very low to the ground, very compact and not comfortable at all. Picture VERY deceiving. Just being honest. Regret buying it. Small and cheap. This item does is not marketed correctly. Returning asap. I thought I was getting a really good deal, but this item is very small, very light and not great quality. I wouldn't buy it again. We ended up selling this set on Craigslist and buying a different set that costs twice as much but was larger and much better quality. I'm an Overstock lover, but this purchase was a great disappointment. First time I feel like it wasn't honestly described. Set is so small that the typical adult cant get comfortable.. It's childrens furniture!! We found the height of the seating very low, but it works. Not for BIG people though (ie over 220 pounds). Outstanding for the price. I bought the complete set, and I'm very happy with it. I've gotten a great deal of use of it, and it holds up great. Very light weight but sucure enough to hold. This furniture is for children ! I am not happy with this set. It is to small, I was expecting the set to be larger. Totally disappointed. The “regular retail price” is greatly exaggerated!! It’s very short and the cushions are not that impressive. Is it worth what I paid for it, *** but I’ll keep it. Read all the specific measurements and reviews before you purchase anything from here. Looking forward to warm summer nights sitting on my new patio set. No, the chairs cannot be stacked. The look and the information on this product sounds great! Quality for a great price. "Can I different colored cushions?" Hello floss922, we appreciate your inquiry. Unfortunately, this item only comes come in the stated (Ivory) color option. We apologize for any inconvenience. We hope this information has been helpful. Thank you for shopping with us. Have a great day! We hope this information has been helpful. Thank you for shopping with us. Have a great day!